This one is for you, spring. I have to admit that I am not entirely thrilled with spring's seemingly early arrival. I am one of those crazy folks who loves winter. I love the cold weather and I love the snow, so I am sad that we had such a mild winter. But when I see the flowers beginning to bloom and the longer day light hours start to creep in, my wintry cold heart softens. I didn't exactly follow the tutorial for this necklace from Sincerely Kinsey. 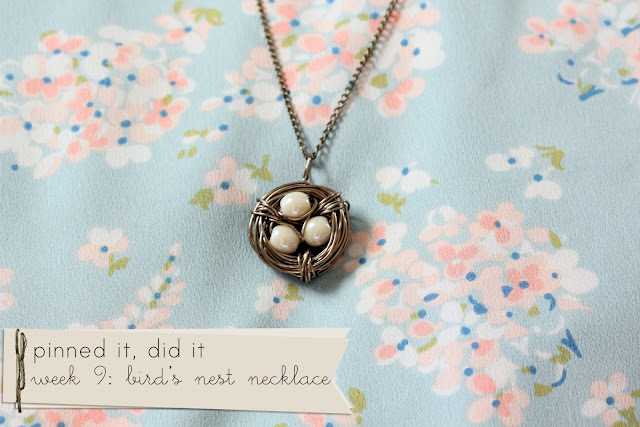 I was more inspired by the look, then I Googled "how to make a bird's nest necklace" and I read a bunch of tutorials, and then just kind of did it using bits and pieces of other instructions. How's that for an explanation? I just made it. I have yet to wear this, as I am a bit of a chicken when it comes to wearing jewelry (get it? chicken! eggs!) Even a simple necklace or pair of dangly earrings have me questioning my taste in fashion. For now, it looks lovely hanging with my other (rarely worn) jewelry. That is sooo cute! Thanks for sharing your PIDIs! I love it! I need one!! Adorable! Seriously... your consistant crafty cuteness amazes me! I agree on the winter thing. Last year we had 10 snow days. 0 this year. At least we will get out in mid-May sometime. I love the necklace too. I attempted this a while ago. Mine came out ok, but I love yours more. So cute! So very cute! I love it! And since we have 5" of snow here, and I hate winter (except in December), I'd trade places with you! LOVE your necklace. So if you don't wear them, what do you do with them? Gift them? This is gorgeous! It's very impressive that you made it. Love! Please wear it- it is beautiful! 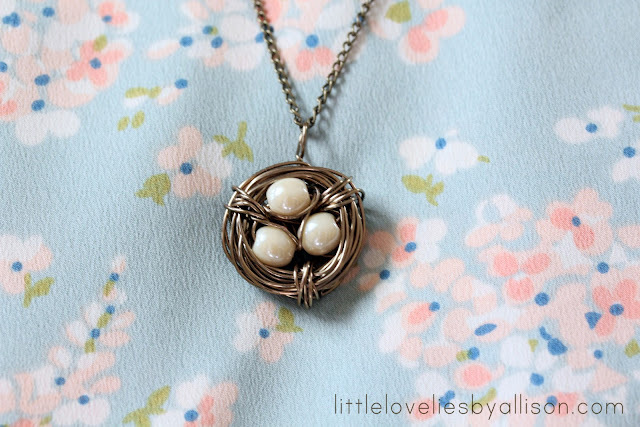 Google a book called "One thousand gifts"
this reminds me of this cute necklace.